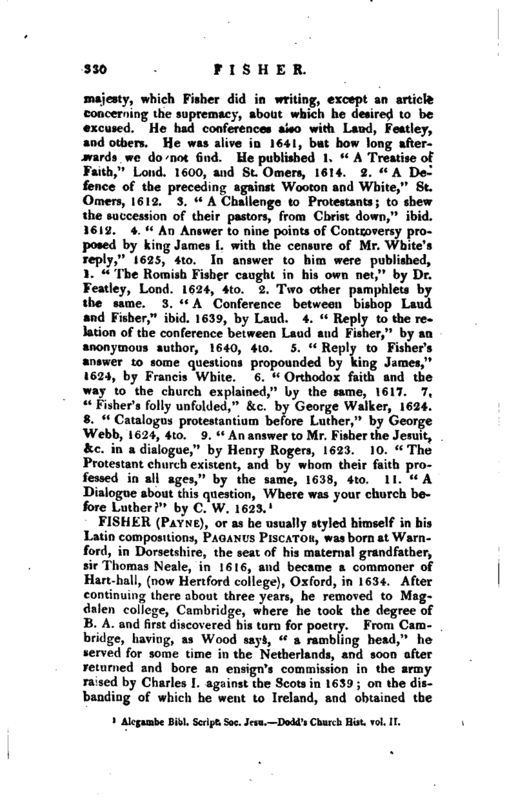 , or as he usually styled himself in his Latin compositions, Paganus Piscatok, was born atWarnford, in Dorsetshire, the seat of his maternal grandfather, sir Thomas Neale, in 1616, and became a commoner of Hart-hall, (now Hertford college), Oxford, in 1634. After continuing there about three years, he removed to Magdalen college, Cambridge, where he took the degree of B. A. and first discovered his turn for poetry. From Cambridge, having, as Wood says, “a rambling head,” he served for some time in the Netherlands, and soon after returned and bore an ensign’s commission in the army raised by Charles I. against the Scots in 1639; on the disbanding of which he went to Ireland, and obtained the | rank of captain, and on his return to England that of major. In July 1644 he served ut the siege of York, and was present at the battle of Mars ton Moor, which he celebrated in his first published poem. Soon after this he left his command, for what reason does not very clearly appear, and came to London, where he employed his pen against the cause which he had supported with his sword, and became such a favourite as to be accounted poet-laureat to Oliver Cromwell. 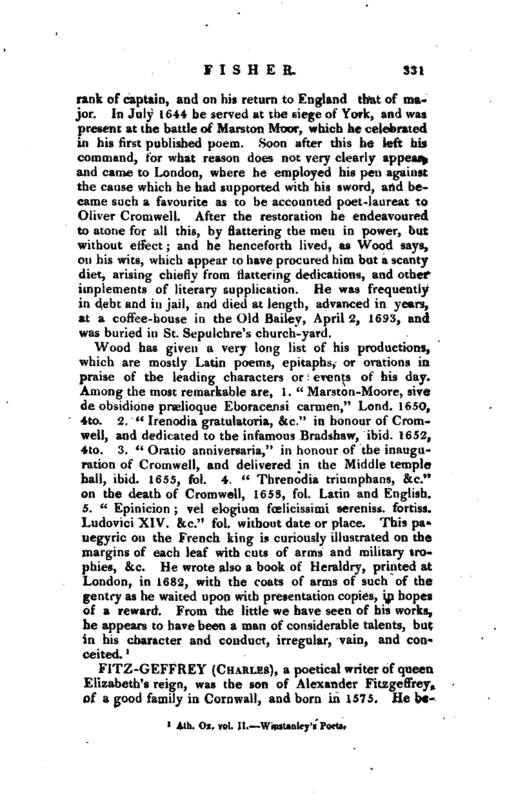 After the restoration he endeavoured to atone for all this, by flattering the men in power, but without effect; and he henceforth lived, as Wood says, on his wits, which appear to have procured him but a scanty diet, arising chiefly from flattering dedications, and other implements of literary supplication. He was frequently in debt and in jail, and died at length, advanced in years, at a coffee-house in the Old Bailey, April 2, 1693, and was buried in St. Sepulchre’s church-yard. Ath, Ox. vol. II. Wiustaniey’s Poets.